“Do this in Memory of Me”: Preparation for First Holy Communion. The 2018/2019 Masses of preparation for parents and children in the Good Shepherd Church are on the following Sundays of the Month at 10.30am. 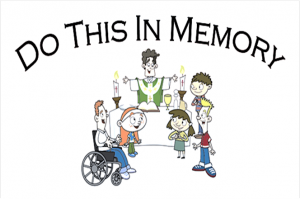 Parents are invited to bring their P4 children to the 8 special ‘Do this in Memory’ Masses as part of their child’s essential preparation for the sacrament of Holy Communion. Sunday 12th May 2019 First Communion: St. Michael’s. The Core Group of 2 parents from each school will normally meet with Fr. Mc Kenna in the Parochial House at 7pm. on the Tuesday evening prior to the Sunday of the “Do this in Memory of Me” Mass, to prepare the Liturgy for the Mass. The meeting normally lasts about 20minutes.